At a recent elearning conference I ran into my mentor and elearning thought leader, Dr. Werner Oppelbaumer. He was showing off examples of elearning courses and offering tips on visual design for elearning. While he was swamped as usual, I was able to steal a few minutes of his time and talk about his latest Werner Labs project and asked if he had any tips to share for the blog readers. I really appreciate all you do to push the science of elearning research forward. 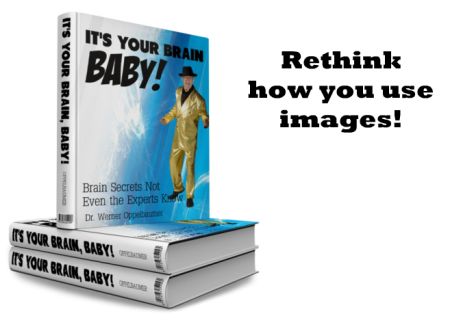 It helps the blog readers and anyone who wants to learn how to build elearning courses. As you know, one of the main issues people have is a lack of resources and time. Your conference presentation on building PowerPoint presentations and elearning courses seems to fill that need. Can you explain more to the blog readers who couldn’t attend? 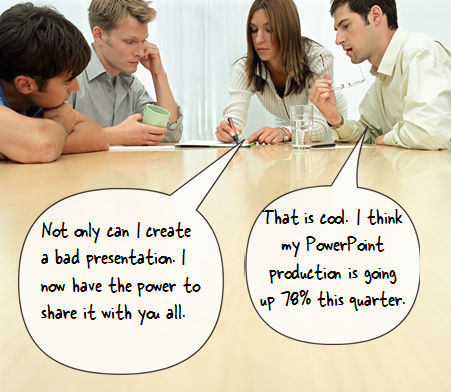 Each day there are thousands of PowerPoint presentations and many of them are not very good. On top of that, most elearning courses created with PowerPoint are not very good. That’s not going to change any time soon. But what we can change is the time it takes to build bad PowerPoints. So we created a system where anyone who creates a bad PowerPoint can upload it and share it with anyone else who needs to create a bad PowerPoint. On top of that you can mix and match your bad PowerPoints to create custom-designed bad PowerPoint files. It’s our new Collaborative Resource Automating PowerPoint system. Bad content is going to be created anyway; we just make it easier to do so. That will be a big time saver for most organizations. We’ve already signed on many large corporations and government agencies. I’m interested in seeing where that goes in the future. Let’s switch topics. You gave a presentation on visual design for elearning. Afterwards, people were buzzing about what they learned. Can you share your tips for the blog readers, too? Sure. The presentation covered three key areas of graphic design for elearning. I’ve included my presentation below. 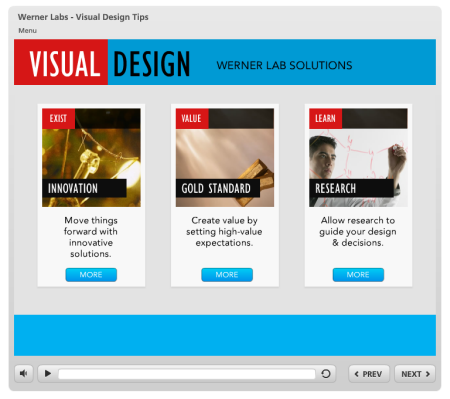 Click here to view the elearning presentation on visual design. Thank you Dr. Werner. You always offer fresh insight and new perspectives on how to build elearning courses. I am sure that the blog readers really appreciate all you do for the industry. Want E-Learning Success? Make Sure Your Learners Are Dressed For It! Sorry, Dr. Werner, but we’re way ahead of you. We’ve been using the CRAP system at our company for years! Thanks, Tom. I’ve been waiting for this post, and you didn’t disappoint. I even had to listen to the whole “Forever Young” song at the end! Thanks for the laugh, Tom. This is great…go for the gold! Each year, I wait breathlessly for Dr. Werner’s instructive tips. Thanks so much for sharing them, Tom. Our SMEs are even now adding to the CRAP library. And please pass along to him, my favorite audio for dissociative eLearning – Shooby Taylor, “the human horn”. DOH! That was hilarious! Thank you, Dr. Werner! Tell him I’ll help out with CRAP if he expounds more on the Gold Standard — in a leisure suit. As always, Dr. Opplebaumer hits the nail on its head, or at least close enough to bend it over so we have to use the hammers claw to straighten it then try and drive it in without it getting bent again, but that’s OK since when it’s half way in we can bend it over and that will be good enough… Oh, sorry went of track there for a minute. By the way, will future Storyline purchases include a free Gert Jonny’s CD? Thanks Tom, I needed a dose of Dr. Werner’s wisdom – and some great new images to help with our disassociative learning library. oh thank you for remembering april fools, love dr werner..but really want Tom back! Once again Dr. Werner proving why, despite the rumours, his thoughts about our industry are worth their weight in gold. It would, however be remiss not to point out though that Robin Williams will probably be taking a lawsuit him for infringement of Acronym though…. I just wanted to comment the last blog post was absolutely brilliant. I should use it as my Master’s thesis in instructional design! Thank you for all your work. Dr. Werner never fails to entertain. I was actually trying to wrap my brain around the disassociative theory…almost fooled! Where can I find the concert schedule for the Gert Jonnys? I’m gonna make all my materials with gold beveled buttons from now on! Thanks for the laugh guys. Thanks for the tips to create a good working elearning. Its hard for me the visual thing on it.